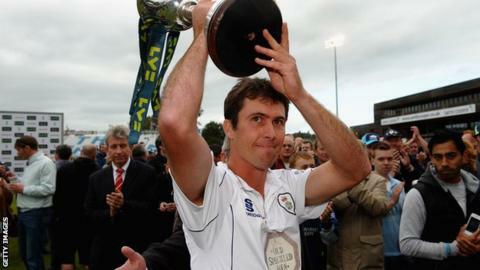 Derbyshire captain Wayne Madsen has been awarded the inaugural Christopher Martin-Jenkins Spirit of Cricket Elite Award. Created by the Marylebone Cricket Club and the BBC in memory of commentator Martin-Jenkins, the awards recognise exceptional sportsmanship. Madsen was recognised for walking of his own accord in a County Championship match against Yorkshire this summer. Alton county cricket under-13 girls' team took the Youth Award. The joint MCC and BBC judging panel were impressed by their story of lending players to field for an opposition side in a league fixture this summer. Madsen's display of sportsmanship came when batting for Derbyshire against Yorkshire on 18 July. He feathered a ball from bowler Steve Patterson to the wicket-keeper and though umpire Jeff Evans gave the Derbyshire captain not out, Madsen opted to walk back to the pavilion, later stating that it was a matter of principle. Madsen went on to score 141 in the second innings, but Derbyshire still lost by an innings and 113 runs. MCC president and lifelong friend of Martin-Jenkins Mike Griffith said: "MCC is passionate about its role as Guardian of the Laws and Spirit of Cricket, and it is instances like Wayne Madsen walking when his Derbyshire side was in real trouble against Yorkshire, which set an example for everyone in the game to follow and must be encouraged." BBC cricket correspondent and Test Match Special commentator Jonathan Agnew added: "During a summer in which the spirit of the game was widely debated, Wayne Madsen gave a wonderful example of what many in the game still hold dear. "Too often we are treated to negative instances, so how nice it is to celebrate and reward such a genuine act of good sportsmanship." Meanwhile, City Academy in Bristol are the first beneficiary of the award's school's prize. They have awarded a £2,000 grant, which will be used by City Academy to support the enhancement of their cricket performance programme. Martin-Jenkins died of cancer at the start of January at the age of 67. He joined the BBC in 1970 and succeeded Brian Johnston as the BBC's cricket correspondent three years later, holding the post until 1991, with a break between 1981 and 1984. Read more about the Spirit of Cricket on the MCC website.